How Is LFC Eradicating Computer Illiteracy with Chromebooks? Be A RESOURCE for someone in need. Donate and Recycle Your used Chromebook! Loaves, Fishes and Computers (LFC) a 501(c)3 nonprofit located in Monterey County, California which purpose is to help local individuals and families overcome the digital and economic divides by providing low-to-no-cost computer systems, digital literacy classes, hands-on technology workshops, and technology assistance/computer repair for low-income individuals, families, seniors, veterans, children, people with disabilities and nonprofit organizations, while providing volunteers an encouraging and gratifying place to learn about Computer Science and Information Technology, and with the help of academic partnering organizations, engage in exciting, new education and career opportunities. We rely on our 208+ yearly volunteers who put in over 1,500 hours per month in order to refurbish donated computers/Chromebooks for local low-income families. 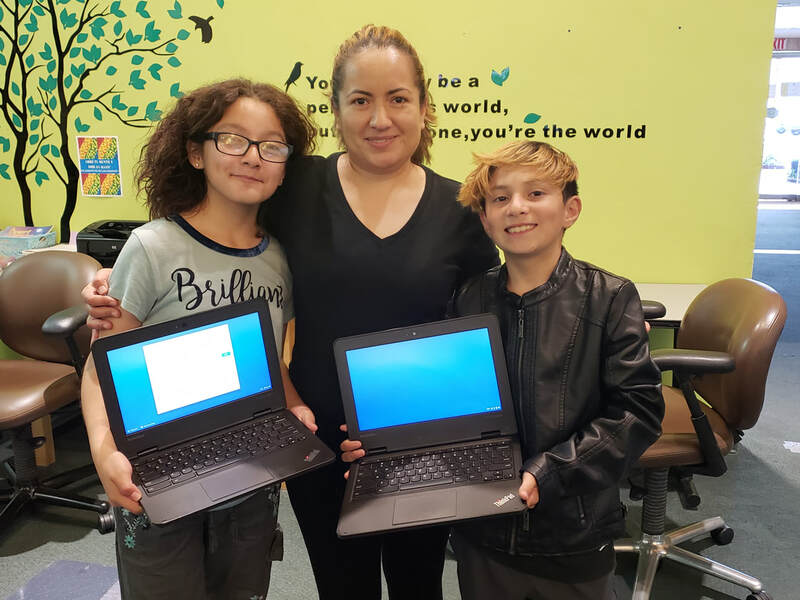 With the growing prominence of Chromebooks in schools and the workforce, we our expanding our mission through our Chromebook Donation Initiative. We happily accept large donations from Schools. The initiative aims to mobilize schools, offices, other organizations, families, and individuals nationwide to expand technology access to those in-need by donating and recycling their used Chromebooks in bulk. With your generous donations, we will continue to help people in-need. ​LFC provides ~2,800+ computers per year to those in need for an average cost of $42. With a modest annual budget of $380,000, we are able to do this because of the generous computer donations and grants we receive. All computers are warrantied, refurbished, data-sanitized, cleaned, bilingual and quality-checked. LFC is also a place where our volunteers learn to work on computers, learn to interact with clients & fellow co-volunteers of all different backgrounds, and learn daily office admin skills. your donation is the key to making this happen. Most importantly, however, every Chromebook that is diverted from the e-waste stream into a mailbox has the potential to have a second life and to open opportunities that will allow people to help themselves. WHAT HAPPENS TO MY chromebook? On receiving your donation, one of our trained volunteer technicians will handle, securely erase, process and prepare your donation for another family or individual to reuse. WHO WILL RECEIVE MY chromebook? It's our goal to provide as many free computers as possible to those people with the most limited resources. People who can prove low-income status or/are apart of a non-profit that serves low-income people are eligible to purchase a Chromebook for low-cost or no-cost. ​HOW DO I DONATE MY CHROMEBOOK? We accept Chromebooks of all conditions. If a Chromebook is deemed not SALVAGEABLE, it will be RESPONSIBLY processed as ELECTRONIC ewaste with our R2/E-Stewards certified collector. While all donations are tax DEDUCTIBLE, a tax DEDUCTIBLE receipt is not necessary for items valued under $250. That said, we will be happy to provide you with one at your request. I think I see Loaves, Fishes & Computers becoming a true service provider and continuing to fill the digital gap that leaves many families unable to access basic technology and information that many people take for granted. Through the Chromebook initiative , Family education campaigns, and partnerships with companies and non-profits, I think it can be achieved."